Tarifa is a picturesque town in the southern-most point of Europe, where the Mediterraean sea meets the Atlantic ocean. Situated by the narrowest point of the Strait of Gibraltar, just 14km from Africa, the town enjoys spectacular views of Africa and the Moroccan Rif mountains. Tarifa is a perfect getaway for those who love to get lost in the small charming streets of the old town, full of secret patios and Spanish architectural gems. But this town encompasses much more than the small medieval fishing village: its ten kilometres of amazing white sandy beaches, the unspoilt countryside of the El Estrecho Natural Park, and some of the best kite & windsurfing conditions in Europe have established Tarifa as a true surfers´ paradise. The coastline is as popular with nature-lovers as with the surfing and kitesurfing community, and between lots of sports and nature activities, it is also the best base for visiting Andalusia and Morocco. Or simply to relax with a glass of wine and admire this paradise. Both our apartments are situated in the historic quarter of Tarifa, in the first line from the sea, in a charming residential building complex with a typical Andalusian style. The location is unbeatable, as it is 70 metres from the Mediterranean seafront, has everything close at hand, including the beach La Caleta, and it is located in the most peaceful and quiet part of the Old Town. The famous Los Lances beach is just 10 minutes walk from the apartments. If you spend your holiday in Andalusia, there is no better way to immerse in the Spanish lifestyle than choosing a typical, stylish apartment that will always remind you of Spain! Admiring the most spectacular views over the Strait of Gibraltar, Africa and the Atlantic ocean from the terrace, relaxing in a historical patio, or chilling in the pretty, traditional Moroccan-style lounge will be your best holiday memories. We are a passionate couple, who fell in love with Tarifa many years ago, and after returning there many times to spend holidays in these amazing apartments, decided to move there and share the love for this magical destination! For us Tarifa is like a small universe and we enjoy every daily moment here – from the morning “cafe solo” in the traditional bar, shopping for fresh fish at the local mercado, walking/jogging/swimming at the breathtaking Los Lances Beach, to watching spectacular sunsets from the coolest beachbars. When the night comes, the cobbled old streets become vibrant and full of happy people, and if you’re lucky, you will even come across a charming flamenco show (and we even haven’t tried kitesurfing yet, so imagine how much more there’s still to discover!). Come and experience this! We speak English, Dutch, Polish, Russian, Spanish and German – feel free to ask us anything! We also travel and explore Andalusia, so we will be happy to recommend you all the best places to visit in the region! Enchanting two-bedroom apartment spread over two floors, with panoramic terraces, situated in the historic quarter of Tarifa, in a charming building of typical Andalusian style. Admiring the spectacular views over the Strait of Gibraltar, Africa and the Atlantic ocean from the terrace, or chilling in the pretty, traditional lounge sofas will be your best holiday memories. The apartment is suitable for max. 4 people (2 double beds). See Africa from the terrace! A living room is fully decorated with beautiful Andalusian tiles “azulejos”. It also has a dining table, a desk and a lounge area. There is also a small sunny terrace, protected from the winds, with an exterior stairway leading to the second floor. I’ve never seen such beautiful tiles in my whole life! There are two bedrooms, equipped with double beds, which are located on different floors, both with double beds. The first bedroom, situated on the first floor, has a double bed and a closet. The second bedroom is situated on the second floor, and is accessible by the outside stairway. It has a unique marine style, as the terrace just next to this room features amazing seaview onto the port of Tarifa, where you can see the Strait of Gibraltar, the Moroccan city of Tanger, and the Atlantic ocean. Often you can perfectly hear the peaceful sound of waves at night. The second floor has also a large, spacious, 2-level terrace with an unbeatable panoramic view over the whole city, as well as over both the sea and the ocean surrounding Tarifa. You can see the Mediterranean coast, with the port of Tarifa, the Strait of Gibraltar, Africa and the Atlantic ocean. The terrace is equipped with a set of outdoor furniture. From the upper part of the terrace you can see perfectly the whole panorama of the Strait of Gibraltar with the Moroccan coast, the amazing Moroccan mountain Jebel Mousa – believed to be the second pillar of Hercules, as well as the city of Tanger. The views cover even the penninsula with the Spanish city of Ceuta, situated on the African side of the Strait. We believe this is the most amazing view in Tarifa, if not in the whole region of the Strait. There is a touristic viewpoint “Mirador el Estrecho”, situated just by our house, but it is much lower than than our terrace. The panoramic view from our terrace is incomparable with the touristic viewpoint. The apartment has also a small kitchen and a bathroom. The kitchen is fully equipped with everything that you may need during your stay. The recently renovated bathroom has a shower and is decorated with hand-painted azulejos made by a local artist in Tarifa. Please note that the entrance to the apartment is on the first floor level, and the upper bedroom is accessible by external stairs, which might be regarded as a bit steep, so the upper bedroom and the terrace might not be recommended for people with motor disabilities. Enchanting old style traditional apartment in the historical Al-Andalus style, rooted in the Moroccan tradition, with a private Spanish style patio. It is full of historical details, such as antic floors or walls tiled with colorful “azulejos”. Amazing location, the first sea line, just 70 metres from the beach La Caleta! The apartment is suitable for max. 4 people (1 double bed, 2 single beds). The whole apartment is on the ground floor, with two entrances: the first one from the small street accessible by car, and the second one from a typical Spanish-style patio. The living room has the entrance from the outside and from the private Andalusian patio – a small terrace where you can enjoy the morning coffee. There is one single bed, transformable into a couch. The main bedroom has a double bed and a traditional-style closet. Local craft details and antique mosaic tiles on the floor add to the cosy atmosphere of the room. The walk-through bedroom is situated between the living room and the bathroom. It is equipped with a single bed transformable into a couch and a stylish closet. Please note that this room has an open doorway to the living room, separated by a curtain. This beautiful, spacious bathroom is a real Spanish-style gem. Covered completely with beautiful tiles, has a shower and a lot of built-in shelves. There are two entrances to the bathroom – it is accessible from the kitchen and from the small bedroom. The kitchen is fully tiled with original “azulejos”. It has an entrance from the outside patio, and from the house it is accessible via the bathroom. In this spacious and fully equipped kitchen there is also a dining table for four persons. Apartment 2 is a very convenient choice for families and smaller groups. Please note, however, that it has an atypical layout, where three premises (the living room, the small bedroom and the bathroom) are walk-through premises. To facilitate the access to particular premises when, e.g. one guest is using the bathroom, it is possible to enter the kitchen/the living room through the patio. 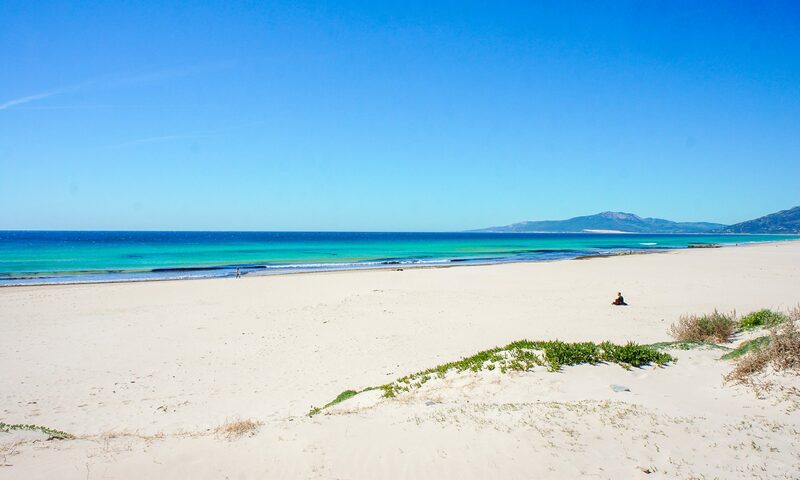 We hope you will love Tarifa! We are looking forward to seeing you here! We are opening the calendar for 2019! Many options available! If you are interested in other dates, or have any questions, please send us an email! In the period of June-August, minimum stay is one week (seven nights). In other months, the minimum stay is three days (three nights). We would be happy to reply to all your questions! Send us an e-mail with the booking request. We will promptly reply you and send a pre-confirmation of booking, the amount due for the stay, and all the official terms and details of rental. You will be asked to make a down payment in the amount of 30% of the rental sum within 7 days after receiving our message. Once we receive the down payment, we confirm your booking. The remaining amount for the stay is paid in advance, at least 6 weeks before your arrival date. Check-in time is from 16:00. Check-out time is until 11:00. Please contact us if you have any special requests. We meet and check in our guests personally at a meeting place near the apartment. You can park your car on the street in front of the house. The parking spaces are free of charge, however they are subject to availability. No pets allowed in the apartments. No parties allowed, as we are situated in a residential quarter. The prices include: electricity, wi-fi, use of the washing machine, water consumption (water from the tap is drinkable), gas for hot water, as well as a set of bed linen and towels. Cleaning costs: € 50, paid cash upon arrival. This fee covers the general cleaning. Deposit: € 200, paid cash upon arrival and refunded within 7 days after the rental period and after positive inspection of the apartment.